A raised crosswalk on North Rockwell Street. 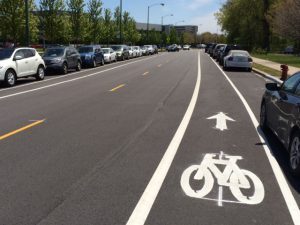 At Lane Tech High School in Chicago, the school and city spent four years working together to improve safety for students walking and biking around the school using changes to the built environment and enforcement to slow down traffic. Teen pedestrians hit by a motorist as they were crossing the street in 2012 spurred the need for improvements to a new level of urgency. What started with a small fix to provide a safer crossing for students grew into a series of projects with effects that expanded beyond the school zone. Streetscape improvements changed the look and feel of the area, and infrastructure additions have led to safer behaviors by drivers, walkers and cyclists. Based on the successes of this project, these efforts help to make the case that investing in infrastructure can result in safety benefits. Though targeted at improving safety for students arriving at and leaving school, the benefits are shared by the 4,200 students at the school, residents of the community and the more than 40,000 cars that travel that area every day. Lane Tech High School sits in the 47th Ward of Chicago and is bordered by Western Avenue, a high-volume, major north-south route through the neighborhood. Speeding had been an issue, with drivers coming off a viaduct that bypassed several intersections to the south of the school. In addition, vehicles traveling north often drove onto a painted median to reach the left-turn lane at the intersection on the northeast corner of the campus. These drivers often sped through this section in order to make the left-turn light. Across Western Avenue are residential and commercial areas and students walk to and from these locations throughout the day. Students crossing at any point along the road combined with vehicle speeds became a concern for the school and the community. These concerns increased after crashes involved teenage pedestrians in both 2011 and 2012 resulted in serious injuries. The initial response to safety around Lane Tech in 2014 became the beginning of a long-term, comprehensive set of projects that led to continuous improvements for the safety of students walking near their high school and community members. The city first installed two pedestrian refuge islands with crosswalks over Western Avenue in 2014. In addition, the first automated speed cameras were placed in a few locations surrounding the school. As a continuation of the work in 2014, further improvements were completed in 2016 with the addition of a raised median extending from the refuge islands along Western Avenue, replacing the painted median. At the same time, the viaduct over sections of Western Avenue south of the school was taken down, and the city improved landscaping, lighting, and sidewalks along the corridor. 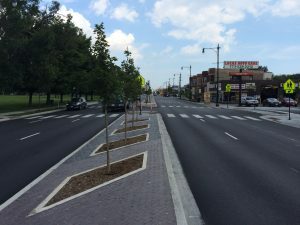 Final results of the work on North Western Avenue including high visibility crosswalks and extended raised medians with pedestrian refuge space. Recognizing the need to make improvements along all routes to the school, the city has not just focused on Western Avenue. Students and community members walk to, from, and through campus from all directions, so the city has identified needs and started to improve spots on all sides of the school. In 2016, raised crosswalks and curb extensions were added to the intersection of Rockwell and Addison, and the restriping on Rockwell in 2017 narrowed lanes. In addition, on this side of the schools, the city is making improvements to a trail through Clark Park on the west side of the school and building a trail connection from this park to parks farther north. Additional Safe Routes to School improvements are planned for installation during 2017. Most of these involve pavement striping, additional signage, and some new bike racks. The treatments applied in the areas around Lane Tech all contributed to a focus on addressing speeding to create a safer environment. Automated speed enforcement monitored the streets within the school zone while students were present. In addition to enforcement, the refuge islands, while creating safer crossings, also serve as a road diet. The islands narrowed lanes on Western Avenue, helping to slow vehicle speeds in front of the school where students frequently cross the street. Future plans will also have the same effect by striping narrower lanes to allow for safer vehicle speeds both near the school and parks. The pedestrian refuge islands installed early in the project had an immediate effect. At the same time, bus stops were relocated to align with the new crosswalk to allow for safer crossings. According to the assistant principal of Lane Tech, crossings became more organized, with students walking in the crosswalk more often. The speeds along this section of Western Avenue also seem slower with the narrowing of lanes by the refuge islands. 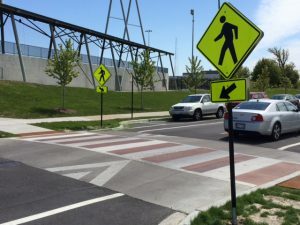 According to Damir Ara, Assistant Principal of Lane Tech, “Drivers not only drive slower, but providing more visibility has made them more aware of pedestrians crossing.” The crosswalks provide a route from the school campus to a commercial section frequented by students. Damir Ara noted that since the improvements in 2013, there have been fewer safety incidents at this location. A bike lane on North Rockwell Street. The projects, while aimed at the population traveling to and from school, also served to benefit the entire community. Lane Tech has 4,200 student and sits within a neighborhood of 56,000 residents, and more than 40,000 motorists pass through this area on Western Avenue each day. By creating a safer environment for pedestrians around the school campus, the entire community benefits from safer access to different parts of the neighborhood and conditions that reduce risk for all road users. Additionally, by upgrading the streets and sidewalks, the look and the feel of walking in the area has improved, creating a more livable place. Community partners working toward a common goal. Before beginning work, community leaders united around a common need. Aware of the safety issues on this road, that need became urgent with the tragic crashes involving teenage pedestrians. With this urgency, the school and community worked together to find a solution. Prioritizing funding. Implementing a solution moved forward with the availability of funds. In Chicago, aldermen have funds specifically available for work in their wards, and Ameya Pawar, alderman of the 47th Ward, put these funds to work on improving safety around Lane Tech. This funding helped turn an urgent need into action by supporting the initial work of installing refuge islands near Lane Tech. Building off initial successes. The project reached its ultimate success in the long term, with work starting in 2013 and continuing through 2016. This was possible with the initial success of the first project. The refuge islands on Western Avenue created safer spaces for crossing a major road while also helping to control vehicles into driving at safer speeds while being aware of pedestrians. Alderman Pawar recognized this success, saying, “This project made the argument for investment in infrastructure to improve safety.” Launching from this success the area received continuous improvements, with the community recognizing that safety would advance through a comprehensive strategy targeting many locations.